Miami-Dade Fire Rescue and FDNY dedicated MDFR Engine Company 3 as a tribute to show MDFR’s dedication and support to FDNY after the tragic events of 9/11. 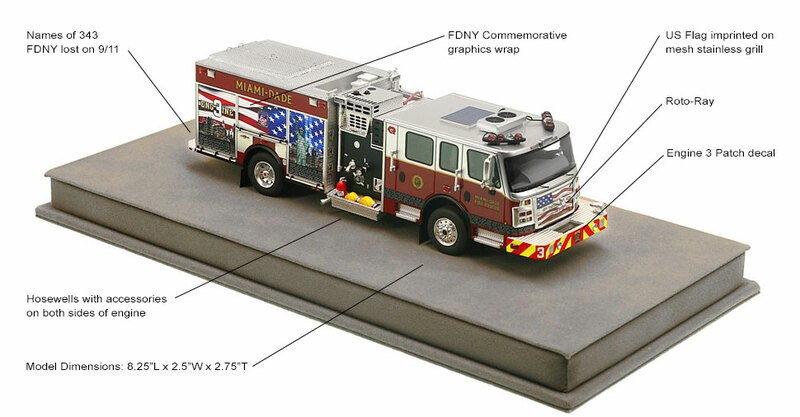 Production of the Engine 3 - 9/11 Tribute is limited to 350 units. Fire Replicas are designed with the elite collector in mind, and manufactured in limited quantities to enhance future value. Engine 3 measures 8.25"L x 2.5"W x 2.75"T and is securely displayed inside a custom case. The case dimensions are 12"L x 6"W x 5.25"T and the platform includes an etched stainless steel nameplate with the MDFR seal, department and truck name. 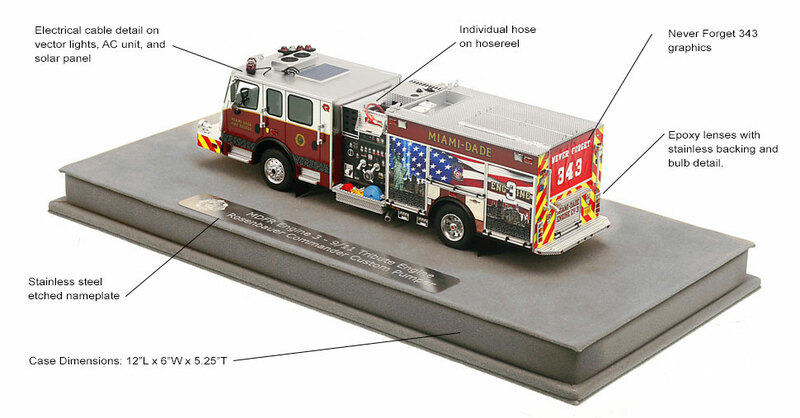 This Miami-Dade Fire Rescue Rosenbauer Engine 3 scale model is a museum grade replica. Like all Fire Replicas models, every detail is modeled to perfection and with razor sharp precision. The replica features the specific department configuration and graphics, leaving no detail overlooked. The display case is custom manufactured with high quality acrylic and resin. The stainless steel etched plate features the department and truck name, and department seal. This replica is a treasure to be displayed and admired and is in no way a toy. On Friday, June 28, 2002, Miami-Dade Fire Rescue and FDNY dedicated MDFR Engine Company 3 as a tribute to show MDFR’s dedication and support to FDNY after the tragic events of 9/11. In a display of support to FDNY, MDFR assigned Engine Company 3 with a new Engine that was outfitted with a unique paint scheme and a specially designed graphic layout. Rather than a traditional MDFR lime green truck, Engine 3 was painted white over red to resemble FDNY apparatus. Breaking this paint scheme tradition was no small feat considering MDFR is the largest fire department in the United States still utilizing this lime green scheme. MDFR has continued their display of solidarity and support in 2004 by dedicating Rescue Company 3 as a 9/11 tribute apparatus with a white over red paint scheme and similar graphics to Engine 3. Additionally, the Miami-Dade County Commission dedicated the roadway in front of Miami-Dade Fire Rescue Station 3 as “Heroes of September 11th Avenue”. These actions along with the actions of the Miami-Dade Fire Rescue Department have firmly placed Station 3 as the “Official 9/11 Fire Station” showing support for the firefighters who lost their lives to the attacks of 9/11. Both Engine 3 and Rescue 3 are currently on their second generation of 9/11 commemorative apparatus. On September 11th, 2015 Miami-Dade Fire Rescue places into service the new 9/11 tribute Engine 3. The apparatus goes into service at precisely 8:46 AM, coinciding with the time American Airlines Flight 11 crashed into Tower 1 of the World Trade Center. The third generation Engine 3 is a 2015 Rosenbauer Commander Pumper and brings together styles from both the old and new designs to help commemorate the events of 9/11. The new Engine 3 proudly sports a unique graphics layout that was designed specifically by MDFR to support FDNY and distinctly recognize the ultimate sacrifice made by so many FDNY members as part of the response to the 9/11 terror attacks on New York City. Continuing with MDFR’s newest tradition of silver over lime green apparatus, the new Engine 3 also incorporates old and new traditions and will now be silver over red. The new MDFR Engine 3 is a display of Miami-Dade Fire Rescue’s continued support and dedication to the victims, First Responders, and our Military in America’s War on Terror. Rosenbauer is the global leader in fire fighting technology with over 150 years of manufacturing experience and 11 manufacturing locations worldwide making them the world’s largest manufacturer of fire equipment. Their range includes Aerials, Pumpers, Rescue vehicles, tankers, industrial and aircraft rescue fire fighting equipment and vehicles. The Miami-Dade Fire Rescue Engine 3 is manufactured by Rosenbauer and has an EXT body with a Northern Power generator, Hale QMAX 1500 Midship pump and a tank capacity of 750 gallons. Power is provided by a Cummins ISL 9L engine delivering 450hp with an Allison 3000 EVS transmission fitted to the RBM Commander chassis. 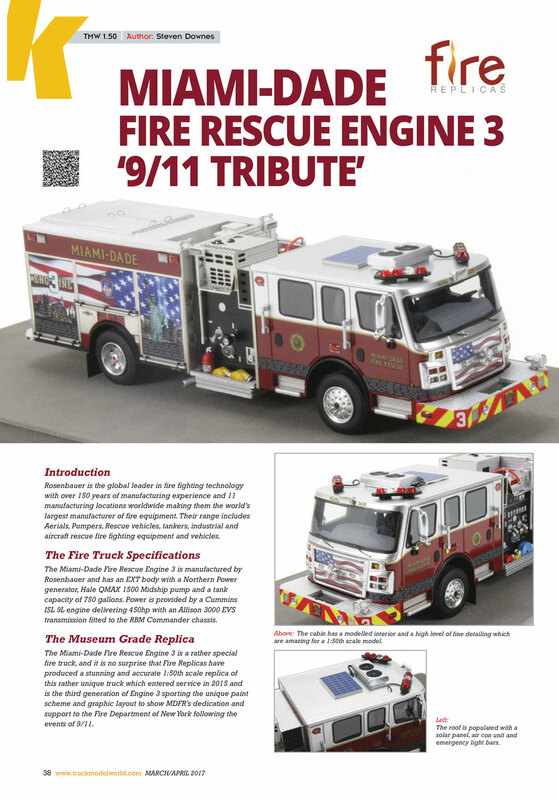 The Miami-Dade Fire Rescue Engine 3 is a rather special fire truck, and it is no surprise that Fire Replicas have produced a stunning and accurate 1:50th scale replica of this rather unique truck which entered service in 2015 and is the third generation of Engine 3 sporting the unique paint scheme and graphic layout to show MDFR’s dedication and support to the Fire Department of New York following the events of 9/11. Miami-Dade Fire Rescue is the largest fire department in the United Stated to still utilize the lime green paint scheme and Engine 3 broke this tradition, originally using white over red and, with the introduction of the third generation, silver over red paint scheme to resemble the colours of FDNY. This is a true tribute to the 343 fire service personnel that lost their lives on 9/11. 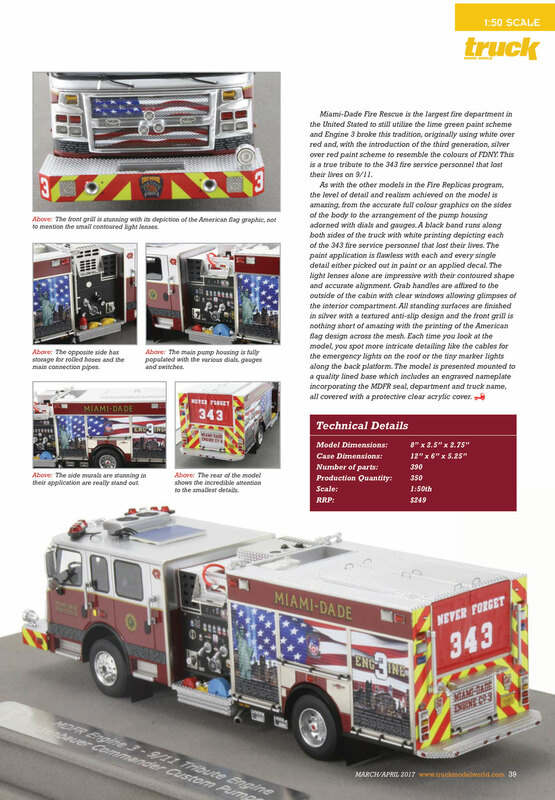 As with the other models in the Fire Replicas program, the level of detail and realism achieved on the model is amazing, from the accurate full colour graphics on the sides of the body to the arrangement of the pump housing adorned with dials and gauges. A black band runs along both sides of the truck with white printing depicting each of the 343 fire service personnel that lost their lives. The paint application is flawless with each and every single detail either picked out in paint or an applied decal. The light lenses alone are impressive with their contoured shape and accurate alignment. Grab handles are affixed to the outside of the cabin with clear windows allowing glimpses of the interior compartment. All standing surfaces are finished in silver with a textured anti-slip design and the front grill is nothing short of amazing with the printing of the American flag design across the mesh. Each time you look at the model, you spot more intricate detailing like the cables for the emergency lights on the roof or the tiny marker lights along the back platform. The model is presented mounted to a quality lined base which includes an engraved nameplate incorporating the MDFR seal, department and truck name, all covered with a protective clear acrylic cover. I have another Miami Dade engine and a Chicago Tower Ladder, both of which are amazing. But because of tbe special color scheme and graphics, this model is simply, in a word, awesome. Astonishing. Incredible. It looks exactly like the original rig, and I am so proud to display the three models together. Bought this as a birthday present for my son, his birthday is September 11. He starts fire standards school next month and is going to be a firefighter. I wanted to look at it as soon as it arrived and was blown away by the detail, I know he is going to love it! Having seen the actual engine, this model is a fantastic replica down to the smallest detail. Another winner from Fire Replicas! After the 2016 & 2017 Seagrave Aerialscopes, having them arrive and seeing the quality, I just had to have this. Miami-Dade's only red engine and what a way to pay tribute to the firefighters who fell on 9/11. "We will never forget"....it's impossible, we witnessed a tragedy and now a way to keep alive the 343 through memories and with a piece like this, a constant reminder, a tribute, it says and represents so much. Thank you Fire Replicas! This is my second model from Fire Replicas and as with the first, the Capitol Heights E-805, I was not disappointed. Like the former, this model is superb, the level of detail is unbelievable and the graphics simply stunning. I collected Code 3 for a number of years before they ceased producing models and was always pleased with the level of detail that they produced, especially in their later models. However, Fire Replicas have taken detail to a new level! Also, the prompt service, the personal touch with the card from Nick and the way the model is professionally presented in the acrylic case just put the icing on the case. I am looking forward to adding further Fire Replicas to my collection!! I love it! Beautiful piece!! The details are amazing!! Definitely getting more replicas !!! Graphics and detail like the real thing!! Just like my first one i recieved. Many more on my list and i know i wont be disappointed. AND a display case included. Worth every hard earned dollar. This was my first fire replicas, and after a long wait and being patient, it finally arrived halfway across the world, to India. I must say, this is the best truck I have in my collection. Superb details, right from the front Q Siren to the ground textures at the back. It simply looks beautiful. The light shines off it, making it even more beautiful! Such detail, such elegance, such beauty, is only found in a fire replicas model. Id recommend this to anyone wanting to have a 9/11 tribute and who is a serious collector. Words are less to describe both the model, and the service. Will definitely buy more of fire replicas! Best start to the new year! Unbelievable detail on the graphics! When I first saw that Fire Replicas was going to produce this beautiful rig two thoughts came to mind - (1) this is great and (2) how will they be able to pull-off the decals? Knowing a little about the real rig, I know that the names of all 343 FDNY members killed on 9/11 are inscribed in the black stripe along the sides of the rig. Listing all these name is no small feat in 1:1 scale, but how will it look in 1:50th scale? Well I'm not exactly sure how they did it, but seeing is believing and Fire Replicas pulled it off, along with all the other intricate decals on this truly stunning rig. Nicholas and company are once again to be commended for "getting it right" and producing yet another fantastic replica!